No matter the problem, sweat is always the best remedy. I often utilize HIIT style training in both my own gym workouts and in my classes. It’s a surefire way to work up a sweat. Plus, not only is it an effective way to train quickly and get the most bang for your buck, but to be honest, I get bored easily and this is a good way to keep my A.D.D at bay. Don’t know what HIIT is? Read up on it here, here, and here. To kick it off, here is an example of a standard workout. Get a mat (if you want – or at least a towel), set a timer (I use a free app on my phone – you don’t need anything fancy), and grab some dumbbells. I will include modifications where applicable but please know that whether or not you choose to use dumbbells or the weight you choose is up to you! PUSH HARD – this shouldn’t be easy – but it is fast, effective and you will be sure to feel great after! Some notes on format. Much of this will follow in later workouts. 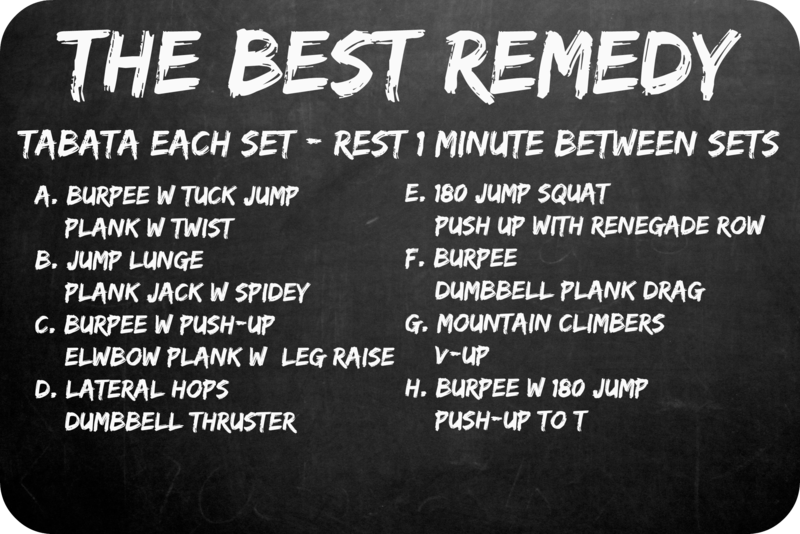 Each set should take you 4 minutes. Rest for up to a minute when you’ve completed all 4 rounds and move onto the next set. Unless otherwise noted, DO NOT do a push-up with your burpee. Don’t worry, we’ll get them in somewhere! All plank variations should be performed with palms on the ground unless it says otherwise. Perform a stationary squat (lunge, hop, etc.) if you aren’t comfortable with the jump.